Stuffed tree frogs and artfully disheveled menswear weren’t the only highlights of Vivienne Westwood’s Spring/Summer 2010 runway show—the grand dame also shod her models in winged jelly sandals in the style of the Greek God Hermes. The “Wing,” available in November, is Westwood’s latest collaboration with Melissa Plastic Dreams, a Brazilian footwear company that uses nontoxic, recyclable plastic to create its vegan wares. Ecouterre is torn about these shoes though—we can’t decide if they’re kitschy chic or just plain kitschy. 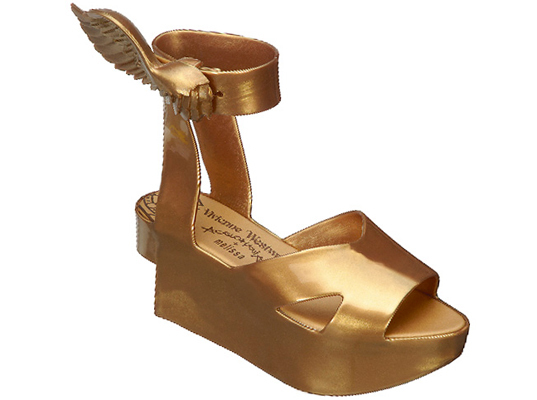 where can i purchase vivienne westwood+Melissa Wing Sandals? Stuffed tree frogs and artfully disheveled menswear weren't the only highlights of Vivienne Westwood's Spring/Summer 2010 runway show�the grand dame also shod her models in winged jelly sandals in the style of the Greek God Hermes. The "Wing," available in November, is Westwood's latest collaboration with Melissa Plastic Dreams, a Brazilian footwear company that uses nontoxic, recyclable plastic to create its vegan wares. Ecouterre is torn about these shoes though�we can't decide if they're kitschy chic or just plain kitschy.